After Douglas Snelling and his teenage sons Christopher, Duncan and Andrew retired to Honolulu in 1977 – mourning the loss of Snelling's second wife, Patricia (née Gale) on Christmas Eve 1976 – they lived in an L-shaped house with lush gardens, wrapped around a swimming pool. This rented residence at Black Point was designed by Hawai'i's top 20th century architect, Vladimir Ossipoff (1907-1998). 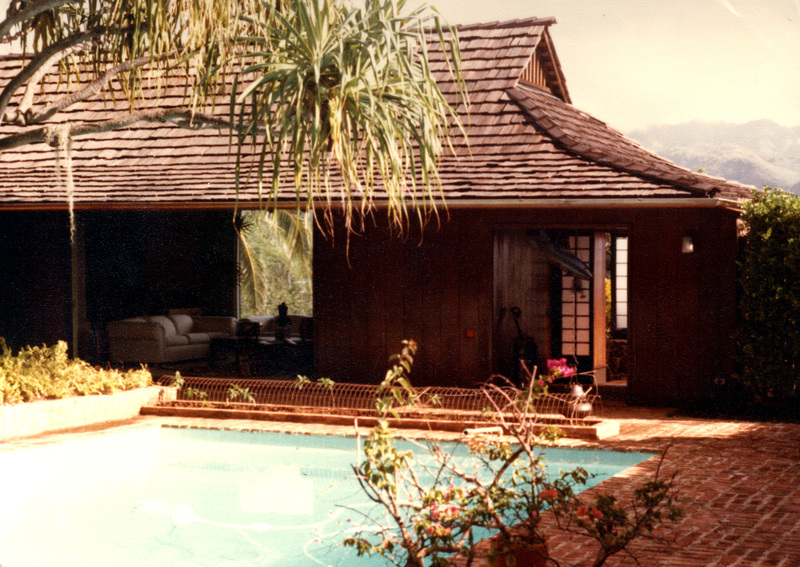 The Black Point, Honolulu residence designed by Vladimir Ossipoff and occupied by the Snelling family during the early 1980s. Photo by Marion Dudek. Ossipoff and Snelling could have first met when Douglas and Patricia visited Hawai'i in the early 1960s, but they became increasingly friendly on later trips there, sharing drinks at the members-only, Ossipoff-designed Outrigger Canoe Club built on Waikiki beach in 1963. 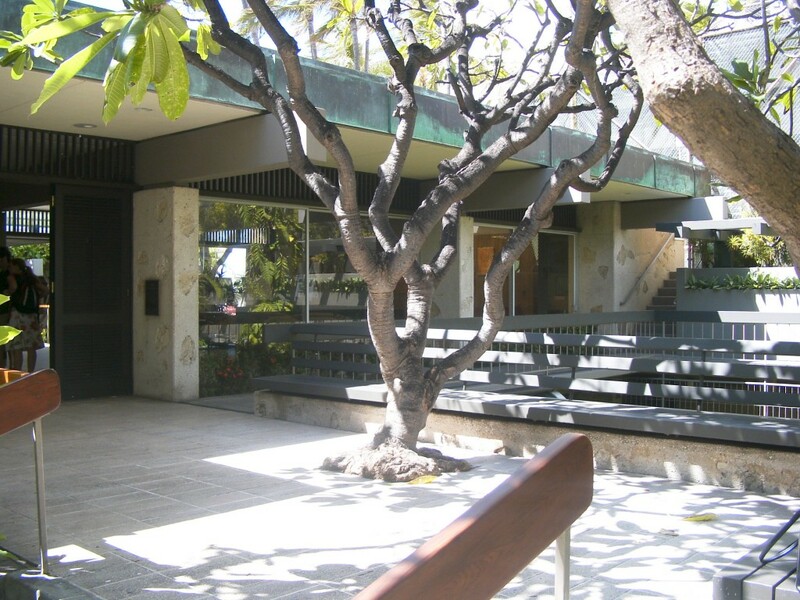 Entry to the Outrigger Canoe Club building on Waikiki Beach, by Vladimir Ossipoff, 1963. Photo by Davina Jackson in 2004. Both architects were following organic concepts – integrating buildings and gardens – that first fertilised the international modern movement via Frank LLoyd Wright's interpretations of Japanese traditions for his Prairie houses in Chicago (1906-1909). Ossipoff's Hawaiian buildings from the 1930s to the 1980s included brilliant examples of 'indigenous modernism' – the approach which gracefully incorporated classical European, traditional Asian, streamlined modern and tropical vernacular strategies and elements, often distinguished by real or imitation thatched roofs. Although Snelling was building in Sydney, a city which did not have any notable history of native architecture, he began to include dramatic 'thatched' roofs (inspired from Indonesian island villages) in all of his major residential and commercial building designs from 1964. Examples were the mid 1960s houses for Sir Theo and Nancy Kelly in Vaucluse and Arthur F. Little in Clareville, his 1968 'Bettina Paradise' house for Jean and Betty Nawa in Noumea, and his 1970-1972 designs for unbuilt compounds for Fiji and Vanuatu. Snelling was attracted to Hawai'i because it became a magnet for wealthy holidaymakers from the American mainland after 1959, when it was declared the 50th state of the USA and the first commercial aircraft, a Boeing 707, landed there with a payload of tourists. His third wife, Swedish artist Marianne Sparre, still lives in Honolulu, as does his youngest son, Andrew. Vladimir Ossipoff's life and oeuvre of buildings were celebrated in 2007 with a monograph, Hawaiian Modern: The Architecture of Vladimir Ossipoff, edited by Dean Sakamoto, Karla Britton and Diana Murphy, published by the Honolulu Academy of the Arts with Yale University Press. The associated exhibition began at the Honolulu Academy of the Arts and travelled to the Yale Architecture School Gallery in Connecticut and the Deutsches Architekturmuseum in Frankfurt. Key Ossipoff buildings covered in the book included the Boettcher House, 1937; University of Hawai"i Administration Building, 1949; Hawaiian Life Insurance Building, 1951; Liljestrand House, 1952; Pauling House, 1957; Diamond Head Apartments, 1958; Blanche Hill House, 1961; IBM building, 1962; Outrigger Canoe Club, 1963; Kahului Airport Terminal, 1966; Booth Luce House, 1969; modernisation of the Honolulu International Airport Terminal, 1970-78, and the National Tropical Botanical Garden Research Campus, 1981-92. In the book Foreword, eminent modernism scholar Kenneth Frampton (Columbia University, New York) credited Ossipoff with 'sophisticated eclecticism' ... 'consciously removed from any ideologically conditioned notion of modernity'. Frampton said that (with exceptions), North American architects did not align themselves with the concerns of the European avant-garde and Ossipoff followed their sceptical, home-grown pragmatic stance in this regard. '... Ossipoff decided, however unconsciously, that the role of the architect was to facilitate and refine the natural, unpretentious requirements of a colonial society as directly as possible, in a climate that, apart from tropical downpours, was benevolent all year round,' Frampton said.